Life's a Beach | Expat Life in Playa del Carmen : Playa del Carmen 4th of July Party at Wicky's Beach Club! Looking for a place to celebrate the 4th of July with your family and friends in Playa del Carmen? 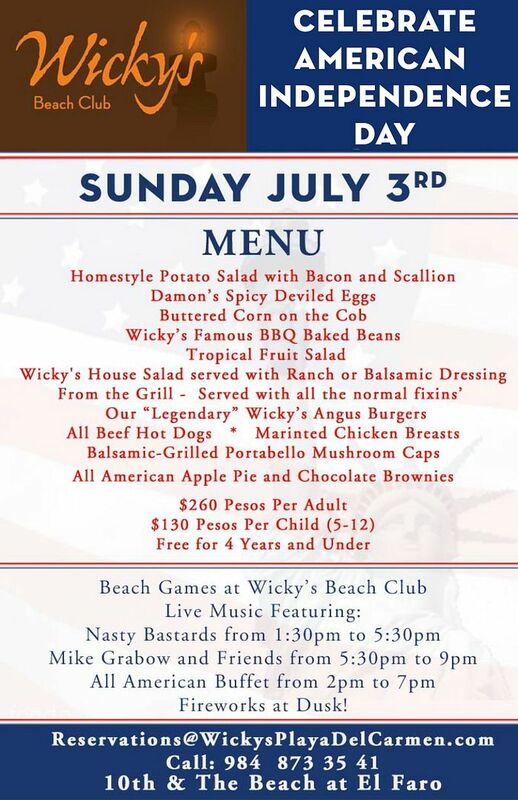 Don't miss the annual 4th of July Celebration and BBQ at Wicky's Restaurant and Beach Club! The festivities begin at noon with live music starting at 1:30pm and FIREWORKS at dusk! Wicky's famous Beach BBQ Buffet will be open from 2pm - 7pm. This is an event that is not to be missed if you are visitor or an expat from the US you will be sure to have a great time!